Make sure my head is screwed on right. Ha! If people only knew. I live with bipolar. Most of the time I go about my life as if I don't have it, but that is only because I take nothing - including an operational brain - for granted. Breathe! I remind myself. All systems go. I'm ready to face the day. Bipolar is entirely the wrong term for my illness, your illness. "Cycling" is far more apt, suggesting the brain in perpetual motion - moods, thoughts, perceptions, everything - nothing standing still, everything shifting, nothing predictable. But is there there anything up ahead I can at least anticipate? Day slips into night, the moon waxes and wanes - my brain is a veritable I Ching. I may head out into the world cool, calm, and collected, but will my brain be working for me two hours from now when it really matters? I already know what I'll be like on the way home, a wrung-out dish rag, too spent to stop off at Trader Joe's. Is there enough food in the fridge? Breathe! I remind myself. Breathe. Way back in 1854, the French psychiatrist Jean-Pierre Falret came up with "la folie circulaire" (circular insanity) to explain the extreme mood changes he observed in his patients. The pioneering German diagnostician Emil Kraepelin coined the term "manic-depressive insanity" to describe what he saw as a much wider and more complex phenomenon. Nevertheless, cycling was a central piece to the puzzle. In the 1921 English translation to his classic "Manic-Depressive Insanity," Kraepelin describes the illness as including "the whole domain of so-called periodic and circular insanity." What we call bipolar is an enormously complex illness, but strip it to its most essential element and what we're left with can be best described as a "cycling illness." Simply knowing that we have ups and downs is not sufficient. What we need to know is how these ups and downs relate, what is driving them, and what else is interacting with the dynamic. Our "episodes" (depressed, manic, hypomanic, and mixed) only make sense in the context of the cycle that propels them. Is our hypomania (mania lite), for instance, a prelude to a crushing depression, or is it a warning that we are about to get swept up in a full tidal mania? And what about the type of things that play havoc with our cycles, such as staying up all night to complete an assignment or cross-country travel? In the second edition to "Manic-Depressive Illness" (2007), Goodwin and Jamison make it clear we are talking about more than one cycle, from the glacial pace of the shifting seasons to daily circadian rhythms. Kraepelin emphasized that there was a lot more to cycling than just mood, including intellect and volition, and not necessarily in sync. This would account for seemingly exotic but in fact fairly common variations to our moods such as "excited depressions" and "inhibited manias." Let's rephrase: We are talking many cycles, not just one. Cycles within cycles, if you like. Throw any one of them out of whack and there goes your precision timing, your sense of being in control. Then life becomes a mad scramble, like juggling spinning plates. Inevitably, it happens - the plates crash to the floor. But always in a perverse slow motion that gives you just enough time to make the horrible realization - yet once again - that things have slipped away from you. And there you are, alone in the awful bitter aftermath, left to pick up the pieces. This morning, I received news that a good internet friend, Katy, lost her life to suicide. She was in her thirties. (See my previous post.) I put this suicide prevention video together in Oct, 2008, within one month of my dear personal friend Kevin losing his battle to his illness. He was 28. Katy was one of the first to offer me her condolences. 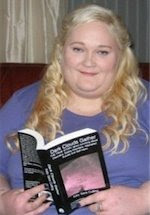 Following is an excerpt from Katy Sara Culling's new book: Dark Clouds Gather: The True Story About Surviving Mood Disorders, Eating Disorders, Attempted Suicide and Self-Harm. Katy was working on a PhD at Oxford when her brain suddenly quit on her. Her story how she fought back from madness makes compelling reading. Katy now works for Equilibrium - the Bipolar Foundation, a charity based in Oxford. It was through my association with Equilibrium that I met Katy. At 10 PM, clad in pyjamas, all the patients slowly gathered to collect their night meds from the clinic room. I joined the line wearing trainers, socks, purple and black cycling shorts, my bright, luminous yellow cycling jacket, cycling gloves, detachable bike lights, keys (hidden in my pocket) and my purple cycling helmet, strapped securely in place on my head. I had a plan: though not such a good one as to think less obvious clothing might have been sensible. I stood tapping my feet impatiently. I said, “Hi,” to Neil, the nurse handing out the meds, quickly downed the concoction, and then walked to the garden door to leave. One of the night nurses asked me, “Princess, where are you going?” “Just for a quiet fag on the step, I can’t face the smoking room,” I replied, showing her my lighter and menthols. And she let me go… against Dr. Ogilvie’s orders! And that was how I found myself heading straight for my flat on Iffley Road at about 10: 30 PM on the 13th November 2002: the night I died. When I arrived home I knew I had to get on with things immediately because at some point I would be missed. I locked and bolted my door, and was grateful that my home address was probably quite hard to find. I pushed my huge antique dressing table across the door – it was so heavy I could hardly move it. I looked for alcohol, but all I had was the bottle of Gordon’s gin I kept for my sister’s visits. I started to swig it neat from the bottle, expecting to hate it, but not actually tasting anything at all. I knelt in front of my tiny attic window, and began to prepare the entire £20 ball of heroin for injection. Someone missed me: Tony. He called me on my mobile to ask were I was. I told him I was fine and to go away. He asked me if I was going to “do something stupid.” I replied that I was fine, but that I was busy and couldn’t talk. I hung up and ignored my phone. I filled a 5ml syringe with what I knew was a concentrated and lethal dose many times over, and, without pausing or hesitation, pushed the needle into a vein. There were no thoughts about upsetting people I left behind; I could not connect with the world or those I love. I just wanted all the thoughts in my head to stop. So, after checking I was in a vein, I started to push the murky brown heroin solution into my body. I thought I could hear the sound of horses galloping in the distance, quickly getting closer and closer. March 27, 2011: This morning I received news that Katy lost her battle with bipolar. I just posted a memoriam on BipolarConnect. I've been running a number of pieces on Hagop Akiskal lately, based on a talk he gave recently to DBSA San Diego. The pieces touched lightly on Dr Akiskal's highly original observations on the interaction between mood and temperament. Below is the heavy-duty complex version, pulled from a 2006 article on mcmanweb. Do fear and anger underpin practically every mood and personality state? What kind of crazy question is that? 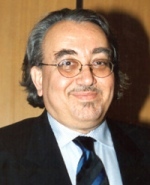 Hagop Akiskal MD of the University of California at San Diego thinks he may have an answer. Dr Akiskal is no fan of the DSM approach of separating out psychiatric phenomena into neat diagnostic parcels. The dynamics of mood and temperament, and their interactions, are far too messy for that, especially when they involve mixed depressions that behave suspiciously like bipolar disorder. In two online advance articles from The Journal of Affective Disorders in 2006, with Brazilian collaborator Diogo Lara MD as one of his co-authors, Dr Akiskal has proposed what can best be described as a "fear-anger dysregulation hypothesis." Dr Akiskal broadly divides personality into four temperaments, including hyperthymic, cyclothymic, depressive, and anxious, each conferring certain adaptive advantages. 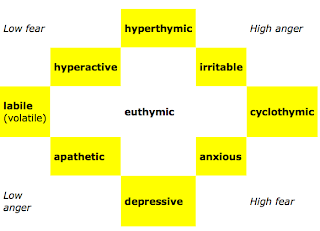 Hyperthymics are the leaders, energetic and upbeat. Cyclothymics are the creative romantics. Depressives tend to be subservient (someone has to take orders and do the grunt work), while anxious types lean toward altruism. These traits are distributed along a continuum ranging in degree from normal and supernormal to the sturm and drang of mood disorders. This is where Drs Akiskal and Lara drop their bombshell. In the first of their two articles, the authors advance the notion that "basic mood states, both normal and pathological, can be conceived mostly as a function of transiently dysregulated or accentuated fear and anger traits." Moreover, they submit that "their combinations and various permutations can predict all major mood profiles, both pathological and healthy." Whoa! Fear and anger for ALL of mood, healthy and otherwise? Is this the new E=MC2 of psychiatry? "Fear is the path of the Dark Side. Fear leads to anger, anger leads to hate, hate leads to suffering." Is it really that simple? Is cutting edge psychiatry nothing more than a remedial attempt to catch up to Master Yoda? Okay, let's assume that Dr Akiskal has not seen too many Star Wars movies. First, let's clear up what Dr Akiskal means by anger, which is not necessarily what you encountered as a kid when you tracked mud over your mom's freshly-waxed kitchen floor. When high anger is coupled with low fear, we are talking about the "sunny side," characterized by pleasure seeking and grandiosity. But add more fear to the mix and we arrive at anger's more familiar "dark side." Oops, maybe Dr Akiskal has watched too much Star Wars, after all. Earlier mood spectrum models call for thinking linearly, in one dimension. Now, Dr Akiskal asks us to think bi-dimensionally. Drs Akiskal and Lara ask you to imagine a square tipped on one corner, sort of like a diamond-shaped compass. Say the authors: "Since cyclothymic and hyperthymic temperaments predispose to bipolar disorder, high anger would be the distinguishing feature of bipolar spectrum disorders." In bipolar disorder, fear modulates the anger. The authors contend that their model also applies to behavioral characteristics that are not disorders, such as entrepreneurship and leadership in hyperthymic individuals. The model does not cover schizophrenia, schizoaffective, and schizoid personality disorder, nor pervasive developmental disorder. Down at the bottom we have depression (D) and dysthymia (dys) which merges into labile features working one way up the square and dysphoric the other way. Everything starts to quiet down as we approach euthymic from any direction. As you can see, according to Drs Akiskal and Lara, not all depressions and manias are alike. Different types feed off differing degrees of fear and anger, typically high of one and low of the other, but often a mix of both. In their article, the authors add that atypical depression involves a "transient downregulation of anger traits," while cycling involves both high fear and high anger, "as one pulls up and the other pulls down." Atypical Depression - Entirely Too Atypical? 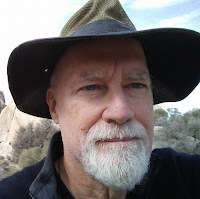 I just finished uploading four new articles on depression on my mcmanweb site. The articles replace and greatly expand upon two earlier pieces that introduced depression. In addition, I also wrote a new article to replace my old one on atypical depression. In other words, are you feeling sort of like you have a bad cold but without the runny nose, fever, and diarrhea? No energy? Can't get started? No motivation? Can barely string two thoughts together? Just want to curl up into a ball and not wake up? Your clinical condition is dead but breathing. You get the picture. Or does your depression feel more like you're in neutral, but with the motor running out of control? "If only, if only," a piece of your over-ruminating prefrontal cortex may be chanting. "I can't take it!" the primitive reacting limbic region of the brain may be screaming. You want to grab the world by the throat and shake it. Folded into all of this may be anxiety. You get the picture. Two very different mental states, obviously. But way too many doctors (my guess is most) refer to both conditions as "depression" and send patients out the door with the exact same prescription. Figuring out depression is very binary, really. Emotion, mental activity, physical activity, and tell-tale behavior - too much or too little, high or low, up or down, under or over. Gradually a picture begins to emerge, a very complex one full of anomalies, a testament to your uniqueness and to the fact that no two depressions are alike. Nevertheless, the picture is likely to resolve one of two ways. Which side of the universe you find yourself on suggests different (though overlapping) treatment and recovery strategies: energizing agents and lifestyle practices for vegetative depressions, calming agents and lifestyle practices for agitated depressions. According to the DSM-IV, as opposed to major depression, the patient with atypical features experiences mood reactivity, with improved mood when something good happens. This would broadly translate to an individual momentarily taking leave of his or her Stygian gloom to laugh at a friend slipping on a banana peel. Likewise, there would be an element of enthusiasm to news of winning the Powerball lottery. In addition, the DSM-IV mandates at least two of the following: Increase in appetite or weight gain (as opposed to the reduced appetite or weight loss of "typical" depression); excessive sleeping (as opposed to insomnia); leaden paralysis; and sensitivity to rejection. Sensitivity to rejection could be interpreted as the flip side to mood reactivity. Here, there is a visible response to bad news rather than good. Either way - mood reactivity or sensitivity to rejection - beneath despair that borders on catatonic, we see signs of life, of a "dead but breathing" individual capable of animation. But is this only confusing the picture? A 2001 study by Posternak and Zimmerman cast doubt on the only feature of atypical depression that is mandatory under the DSM - that of mood reactivity. In their study, the authors evaluated the five symptoms of atypical depression across five different groups of patients (including women, different age groups, and according to severity and length of time of symptoms), and discovered mood reactivity only featured among the women patients, suggesting this particular criteria should be dropped. Then, in making a diagnosis of "major depressive disorder with atypical features" the clinician, in effect, is asked to contradict parts of that same check-list. ...reflects the theory that mood nonreactivity is the essential symptom of "endogenomorphic depression", which was proposed by Klein as typical depression. Consequently, the concept of atypical depression has become overextended and gradually lost its construct validity. In the current discussion over what constitutes atypical, psychiatry has lost sight of the fact of how the term came about in the first place - as a hypothesis for why certain patients with unipolar depression responded to MAOIs rather than tricyclics. Let the conversation build on that important piece. The old DSM-II of 1968 distinguished between “endogenous” and “exogenous” depression, namely between what it saw as depression occurring as a result of the mysterious biological processes of the brain and depression as a result of how one reacts to one’s environment. In one sense, the DSM-II was making a naive “mind-brain” distinction. Yes, it is useful to think in terms of the mind. But every decision we make, every thought process, every emotional reaction, is mediated through the meat housed inside our skulls. And some meat is not as well-equipped as others to handle the load our environments dump on us. But the endogenous-exogenous distinction does encourage us to examine where our depression might be coming from. If your marriage is falling apart, for instance, or your situation at work is going badly, it is obviously worth exploring this association. Sort of like investigating whether a person with a pulmonary disorder is working in an asbestos mine. For some crazy reason, the “modern” DSM-III of 1980 and its successors didn’t think this was important. Was I “depressed”? Sure. But was it clinical depression? No. We all have our bad hair days. The DSM mandates at least two weeks for a depressive episode. But suppose my bad hair day had triggered something far more pernicious, a depressed state that persisted for weeks and months? Clearly, I would be in a state of clinical depression. I knew I could ill-afford to assume that I would rebound from my bad hair day. The situation was not going to go away. There would be post-election follow-up. Days on end of mindless blah-blah-blah. Days on end of exposure to that same stupid grin. For me and my biologically vulnerable brain, this was the equivalent of sending me back down into an asbestos mine. My obvious solution was to immediately change my environment: A total news black-out. No discussing politics. Also, as a result of my depressive funk, I found myself unable to concentrate on my usual work. So I turned to a different project. This turned out to be my neglected draft to a book I had in mind. The change in routine reanimated me and booted me out of my depression. I completed the manuscript a couple of months later, then found a publisher. Maybe I should have dedicated “Living Well with Depression and Bipolar Disorder” to George W Bush. I've just been reading Emil Kraepelin's classic "Manic-Depressive Insanity." Never heard of him? Bet you heard of Freud, who was born the same year. All Kraepelin did was "discover" manic-depression, schizophrenia, co-discover Alzheimers, and found diagnostic psychiatry. His body of work, based on meticulous observations of thousands of patients in German asylums, spans from 1893 to 1927. "Manic-Depressive Insanity" was published in English in 1921, extracted from his much larger "Compendium." Manic-depressive insanity ... includes on the one hand the whole domain of so-called periodic and circular insanity, on the other hand simple mania, the greater part of the morbid states termed melancholia and also a not inconsiderable number of cases of amentia. Plus "colorings of mood" that embrace both pathology and personality. All these diverse elements, claims Kraepelin, "represent manifestations of a single morbid process." In other words, someone who cycles up and down, gets depressed, flips into mania, has messed up thinking, and has stuff going on with moods is suffering from one illness, not five, not twenty-five. Equally important, the depression itself (even without evidence of mania) is strong evidence of manic-depression, not something else. All this was revolutionary thinking way back in the first part of the previous century, and still remains ahead of the curve in the first half of this one. Kraepelin's view of manic-depression, then, is vastly more inclusive than the modern DSM's "bipolar disorder," which does not recognize recurrent unipolar depression. Modern psychiatry, instead, lumps recurrent depression with chronic depression, which explains why antidepressants don't work for a good many individuals and can even cause harm. You would think the DSM-5 would fix this, but do psychiatrists listen? In addition to offering finally-detailed clinical descriptions of depression and mania, Kraepelin identified transient "mixed" states. Here, we can truly appreciate the master at work. The reason you probably haven't heard about all this is because the DSM flies in the face of reality by categorizing a mixed state as full-blown depression coexisting with full-blown mania. The DSM-5 would partially redress this, but comes nowhere near to restoring Kraepelin. Kraepelin has been referred to as the father of modern psychiatry, but that does him a grave injustice. If Kraepelin were alive today, he would take a match to the DSM and start over - I've heard that sentiment expressed by a good many reform-minded psychiatrists. His "Manic-Depressive Insanity" from 1921 remains state-of-the-art. The psychiatry of 2011 has a lot of catching up to do. I put this together for NAMI San Diego. Our annual Walk is taking place Saturday, April 16 at Balboa Park (6th and Quince), and I urge you to attend if you're living in the area. You can register on site (beginning at 6:30 or in advance on the NAMI San Diego website). You can help me support NAMI San Diego by making a donation on my Walk Page. Four of the symptoms can be considered physical in nature. So imagine, your doctor checks off "depressed mood most of the day" (whatever that may mean) PLUS weight gain, hypersomnia, psychomotor slowing, and fatigue. What does that tell us? For one, it tells us nothing about our state of mind (stressed? overwhelmed? feeling empty?) Nor do we get a good read on our emotions (blunted? over-sensitive? fearful? not caring?). Nor do we get a sense of how we're thinking (over-ruminating? unable to put two thoughts together?). Only four symptoms actually probe for state of mind, and these hardly contribute to a complete picture. But for the purposes of the DSM it doesn't matter. Five symptoms, and - voila! - we are "depressed." Look at those same four symptoms again. Granted, they don't tell us what is going on inside our head; nevertheless they represent fairly good markers of the brain in a state of distress. But what kind of distress? Three of the symptoms are presented as sets of opposites, too much or too little - appetite, sleep, activity. Obviously, someone who can't eat and sleep and is pacing about like an over-cranked wind-up toy is in very different mental shape than someone who someone who can't stop eating and sleeping and can't move (and almost certainly has no energy). Yet - get this - according the DSM, both these individuals have the exact same condition. One is exhibiting outward signs of being an over-ruminating fearful nervous wreck, the other is showing signs of needing to be on life-support. Yet a doctor - with the full authority of psychiatry's diagnostic Bible - will diagnose each one with "depression" and send both out the door with the same prescription. Basically, if you want to know about bipolar, you read the usual literature. If you want to know what is really going on, you read Akiskal (and Frederick Goodwin, and Robert Post and a few others). Akiskal’s thinking is light-years ahead of just about all of his colleagues, but there is something very old-school to his approach. Like his hero Emil Kraepelin, Dr Akiskal’s insights are based on countless zillions of hours of exceptionally meticulous clinical observation. Yes, a PubMed search reveals 400 published articles to his name, but all are informed by a lifetime of listening to actual patients. Then, like many psychiatrists, he treated 50 to 60 patients in once- or twice-weekly talk-therapy sessions of 45 minutes each. Now, like many of his peers, he treats 1,200 people in mostly 15-minute visits for prescription adjustments that are sometimes months apart. Then, he knew his patients’ inner lives better than he knew his wife’s; now, he often cannot remember their names. Then, his goal was to help his patients become happy and fulfilled; now, it is just to keep them functional. Actually, it’s a lot worse than that. At least good old-fashioned VW mechanics knew how to tear apart and put back together the whole car. In today’s scary new world of faux-psychiatry where insurance companies call all the shots, Dr Levin is more like the guy who performs oil changes at Jiffy Lube. All that wealth of experience - wasted. Perhaps you can see where I’m going with this. If psychiatrists no longer have time to listen to their patients and carefully observe, where are their insights going to come from? A lot of what passes for academic psychiatry these days is performed by researchers who don’t even see patients. This explains why the DSM symptom lists are so spectacularly out of touch with clinical reality. This explains why the people putting together the new edition of the DSM don’t even deign to listen to Akiskal and Goodwin. Psychiatry these days is a by-the-book exercise, and the book is wrong. Eventually, all our new understanding of the science of the mind will come from brain science and genetic research. But two years ago I heard leading schizophrenia researcher David Braff at a conference caution against the devaluation of clinical experience. Basically, the lab hotshots require the insightful observers of reality tell them where to look and what to look for. Indeed, Dr Akiskal has been doing that for years. In his talk on Monday, Akiskal made reference to his collaboration with psychiatric geneticist John Kelsoe of UCSD. Essentially, instead of searching for elusive bipolar genes, Akiskal pointed Kelsoe in the direction of genes that influence affective temperament, which promises to be a more fruitful exercise. Trust me, a geneticist would never have thought of that on his own. But with a new generation of psychiatrists performing lube jobs, with academic researchers not seeing patients, where are the clinical insights going to come from? As Louise said, Akiskal and Goodwin - not to mention their generation - are a dying breed. When they go, there will be no one to replace them. The subject of temperament came up in passing in Hagop Akiskal’s talk to DBSA San Diego that I attended on Monday evening. Temperament is very central to Akiskalology and the art of understanding what is really going on with our moods. Unfortunately, Dr Akiskal’s audience got too involved interrupting his presentation for generic Ask-the-doctor questions for him to string together two sentences in a row on the topic. I was in Philadelphia attending my very first American Psychiatric Association annual meeting. Twenty thousand psychiatrists and industry hacks (it’s often hard to tell the difference) were in town for the six-day extravaganza. Biological psychiatry was singing high praises to itself. New meds were coming on the market and the best brains in the business were figuring out smarter ways to use the current ones. Even the highly critical commentary supported the basic paradigm - namely that there was a pharmaceutical answer for just about everything that went wrong beneath the hood. Even if we didn’t yet have all the answers, they were well within our reach. So it was that I entered a dark and crowded room to hear Dr Akiskal for the very first time. Although I was familiar with the name, I only had the barest superficial knowledge of his work. I had been expecting him to elaborate on why some forms of depression should be regarded as bipolar, when a bunch of “It’s Greek to me” stuff came up on his PowerPoint. Literally. Up went slides of the Greek four humors (or temperaments), such as “melancholia” (literally meaning black bile). What did this have to do with psychiatry? was my first reaction. Then again, I rationalized, Akiskal was probably just setting the scene. It’s a recurring problem with medical doctors who probably took arts courses in their undergraduate years. But then he started elaborating on the four humors. Not only that, he came up with his own version of the four humors. And not only that, he came up with evolutionary reasons for the four humors. Okay, this has gone far enough, I thought. Enough, already, with this rambling prelude on ancient history. Let’s cut to the fugue. I’m here to find out about depression and bipolar. I won’t say I was disappointed. Rather, I was confused, like listening to a difficult piece of music for the first time. I had a lot of stuff to report from that first APA meeting, but Akiskal’s presentation wasn’t one of them. Such are the pitfalls to being deaf-dumb-and-blind to the thinkers and visionaries in our midst. By temperament, Akiskal is referring to heritable “stable behavior traits with strong affective coloring,” throughout life. Thus, downbeat may be your baseline personality “trait”, which is a very different proposition than being in a temporarily depressed “state,” but the two are related. So much so that understanding how this state-trait dynamic works for us is crucial - absolutely crucial - to our wellness. 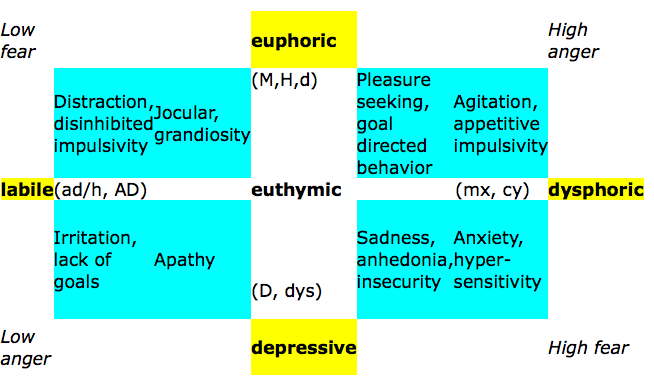 Drawing upon the work of the German psychiatrist Ernst Kretschmer writing in the 1930s, Akiskal points out that temperament and various related personality constructs may not only set us up for mood disorders, but can be considered as sharing the same continuum, from healthy to extreme (though much more research is needed to bear this out). 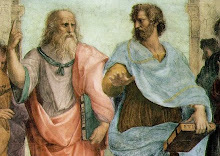 The concept that different kinds of temperament are constitutionally based types of behavior can be traced back to the ancient humoral theory of Hippocrates. About 90 years ago, Kraepelin described four basic affective dispositions (depressive, manic, cyclothymic and irritable), which he believed to be subclinical forms and many times the precursors of major affective psychoses. Moreover, these temperaments can be found in the blood relatives of those with manic-depression (which would include recurrent depression as well as bipolar). Indeed, as Akiskal pointed out two nights ago, it’s the relatives of bipolar patients who tend to benefit from having bipolar characteristics (namely in a genetically dilute form), not necessarily the patients (who unfortunately get hit with the illness full strength). Indeed, relatives and bipolar IIs are more likely to have creative accomplishments (borne out in surveys he has conducted) rather than those with bipolar I, who have far too much to contend with. To very loosely translate Akiskal, imagine two individuals giving very dazzling presentations in a large room. One is on the way to a brilliant career. The other is headed for a crash. Same behavior, very different result. The naturally upbeat individual will power on through thick and thin, and be abundantly rewarded. The temporarily upbeat individual is living on borrowed time. But it’s much more complicated than that. Even hyperthymic individuals can go over the top (just ask Monica Lewinsky’s erstwhile boyfriend). And hyperthymia overlayed with a depressive state is playing with fire. Confused? So was I back in Philadelphia in 2002. Hagop Akiskal of UCSD is bipolar’s ultimate insider-outsider, at once the field’s elder statesman and enfant terrible, the best-known name in an establishment that would often rather not know him, and vice-versa. “I have no use for the DSM,” he told me as I greeted him last evening at a talk he was about to deliver to the San Diego chapter of DBSA. And he was only just getting warmed up. Dr Akiskal’s presentation was more in the nature of a conversation, with revealing tangents that allowed his audience rare glimpses into the mind of a visionary-at-work. A lot of what you read here on "Knowledge is Necessity" is highly derivative of Akiskal, and for good reason. Basically, if you want to know about bipolar, you read the usual literature. If you want to know what is really going on, you read Akiskal (and Frederick Goodwin, and Robert Post and a few others). “Most depressions are at some level bipolar,” Dr Akiskal told his audience. Akiskal literally owns the terms “bipolar spectrum” and “mood spectrum,” which view both mood and temperament as blended shades of the same phenomenon rather than separate entities. Thus depression typically has elements of mania or hypomania, and vice-versa. Agitated depressions, if you like, or dysphoric manias. Think road rage, even if you don’t drive. Just to make things interesting: Imagine if you have an upbeat (what Akiskal calls “hyperthymic”) temperament. You get depressed - “state,” in effect, superimposed over “trait.” It doesn’t take a rocket scientist to realize that your depression is likely to look quite a bit different than that of the melancholic type sitting next to you. But until Akiskal arrived on the scene no one in psychiatry even came close to thinking this way. Okay, maybe Emil Kraepelin, a name Akiskal drops every chance he gets, including at least three or four times last night. Kraepelin, who was born the same year as Freud, coined the term, “manic-depression.” What Kraepelin meant by manic-depression embraced recurrent depression as well as bipolar. The DSM-III of 1980 missed this completely, as did the DSM-III-R of 1987 as did the DSM-IV of 1994 as did the DSM-5 (due out in 2013). See why Akiskal has no use for the DSM? “They are spending millions of dollars on the DSM-5,” Akiskal thundered. “I refuse to be part of it.” The DSM, he says, lists “five hundred ways to lose your sanity.” It could be simplified, he said, to about five or ten or fifteen. “I don’t believe in borderline,” he threw in for good measure. "Do all bipolar people lie or is it just my husband?" "My boyfriend is bipolar and is coping with heroin." "Is this an episode loving another man not my husband?" "My husband is bipolar and every time we talk he always tells me I'm attacking him." This is a sampling of queries that frequently arise on HealthCentral's BipolarConnect, where I contribute as an "expert patient." Are you beginning to spot a pattern? First, let me say that these people and others are asking in good faith. They are going through hell. They are at the end of their rope. They are desperate for answers. Yes, bipolar is the cause of [your husband's lying, your boyfriend's drug habit, your own infidelity, your husband's inability to discuss issues with you, and on and on]. Bipolar is a highly treatable illness, and with the right treatment these problems will all go away. These days, bipolar is copping a bad rap for no end of inappropriate behaviors. I think a lot of it has to do with the raised awareness of bipolar. Now, when people encounter behavior they don't like, the prime suspect is bipolar. Ironically, raising awareness may have raised stigma. Inevitably, when responding to these questions, I point out that a mood disorder is very different from a personality issue or a personality disorder. Yes, there may be a connection. Yes, a mood episode obviously influences behavior. But first, it pays to make a separation. To start, a mood disorder is morally neutral. Fluctuations in mood have nothing to do with one's personal character or values. Hitler may have had bipolar, but he was going to invade Poland, anyway. On the other hand, there are complications. Hitler imprudently invaded Russia with winter coming on. Were it not for his unbalanced mental state, it is possible to imagine a far different outcome to World War II. Psychiatry makes a very clear distinction between mood disorders and personality disorders. To vastly oversimplify, a mood episode is seen as "uncharacteristic" of an individual's baseline behavior. With a personality disorder, outrageous behavior is seen as embedded into an individual's make-up. With the former, the perception is that meds will quickly resolve the issue. With the latter, we see a far more problematic future. Thus, you can see the logic in the desperate pleas of my readers. Please tell me it's bipolar, they seem to be saying. Then with a quick fix my abusive husband will become loving, my selfish wife will become considerate, my egotistical boyfriend will become understanding, my indifferent girlfriend will become caring. Unfortunately, my correspondents almost always describe behavior far more indicative of a personality disorder than a mood disorder. The bottom line is a loved one should not have to distinguish a bipolar episode from a personality disorder or just plain inappropriate behavior in the first place. Hurt is hurt, no matter what illness or condition or character defect you assign to it, and no one - for any reason - should have to put up with this type of abuse. But the people I hear from are willing to give their partners a second chance, to work with them, to help them. To give the relationship a chance. Alas, I have to tell them probably not. 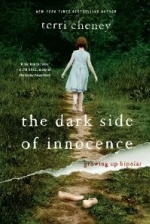 UPS just dropped off Terri Cheney's latest book, "The Dark Side of Innocence: Growing Up Bipolar." You may be familiar with Terri's "Manic: A Memoir," which hit the NY Times best-seller list soon after it came out in Feb, 2008. Rewind the life of any adult with bipolar and you will find a childhood we would all desperately like to forget. Terri Cheney unflinchingly remembers, and in the process of telling her story bears painful witness to all of ours. Killing yourself at any age is a seriously tricky business. But when I was seven, the odds felt insurmountable. Before we examine the brain, let's look at an adjacent organ - the eye. There are convincing studies, published in reputable journals such as JAMA, showing that various nutrients - in particular lutein (found in dark green leafy vegetables) significantly reduce the risk, or slow the progress, of age-related macular degeneration (AMD). They address a condition that everyone clearly understands (loss of vision in the center field). We know this condition's causes and effects (build-up of blood vessels supplying the retina in one form of the illness). We can identify a specific region of the anatomy (the macula in the retina). We know this region's function (high resolution vision). We can identify specific biochemical processes (such as cone cells processing light). We have linked a specific agent (lutein) to the macula. We see a clear link all the way down the chain from treatment (lutein) to structure (intact macula) to function (operating macula) to outcome (good vision, lower risk of AMD). They attempt to address a condition that no one understands (feeling sad? loss of energy? irrational thinking?). We don't know this condition's causes and effects (environment? biology?). We can't identify a specific region of the anatomy (hippocampus? amygdala? anterior cingulate? cortices?). Even if we could identify a specific region (in all likelihood we are talking many regions), we are a long way from connecting function to the condition we are trying to fix). Our understanding of the specific biochemical processes is primitive (such as "chemical imbalance" involving serotonin or dopamine). We have not linked any specific agent to any region or any process. We cannot show any clear link all the way down the chain from treatment (with any agent) to structure (such as changes to specific brain regions) to function (such as an optimum anterior cingulate) to outcome (feeling good? more energy? rational thinking?). Just to be clear, I have used these same arguments elsewhere to demonstrate that we have clear lack of evidence for using antidepressants to treat depression. They were testing for the wrong condition ("depression," as opposed to something more specific such as loss of energy or lack of motivation) on a wide population (anyone who was "depressed") with no understanding of the underlying biology or the environmental conditions that bring on "depression". Thus, if you are skeptical of meds for psychiatric conditions, be equally skeptical of supplements for psychiatric conditions. No matter what you may hear - from any source - we have no credible evidence remotely approaching what lutein does for macular degeneration, nor are we likely to for decades to come. This is a short story of a lovely experience I had yesterday. I went shopping along San Diego’s antique row for some night tables and other odds and ends for my bedroom. I had made a similar excursion three weeks before to help stock my living room. When I moved into my new apartment six or seven weeks ago, the only sticks of “furniture” I owned were my three didgeridoos. Literally, I built my entire living room around the my didge collection. 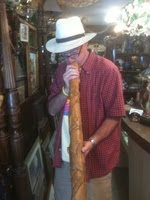 One shop in particular featured an eclectic mix of really cool stuff (such as a vintage edition of a book of paintings by New Zealand artist Peter McIntyre), but I was totally unprepared for the sight that greeted me - a beautiful hardwood hand-carved didgeridoo. Surely, I thought, it’s merely a decorative piece. It could not possibly deliver a quality sound. I picked it up, running my fingers down the serpentine carvings. I positioned the bell end of the instrument on the floor, drew in a breath and blew. I wasn’t expecting much of a sound, particularly with warm-up breaths. But the didge proved exceptionally responsive. A promising tone issued forth. I gathered myself, got an airflow going, and experienced a wonderful warm resonance. Even with the carpet absorbing the sound, there was no escaping the fact that this baby sounded as good as it looked. I looked at the price tag. $150. I owned two didges that cost me twice that. The carvings alone made it worth the price. The person minding the shop was filling in for the owner and knew nothing about the didge, but was expecting the owner to call in about an hour. What do you call it? he asked. How do you spell it? A didgeridoo is probably the oldest wind instrument in the world, basically a hollowed out tree trunk. On a simple level, it delivers a deep rich pulsing drone, augmented by vocalizations and tonguing variations, which is about my level of playing. A skilled musician can wail the crap out of it. Aboriginals from Australia’s north coast fashion theirs from stringy bark eucalyptus. The instrument is central to their cultural and spiritual traditions. Over the last decade or two, the didge has caught on in the west, and we now see the instrument fashioned out of all manner of material. I have one Aboriginal didge. My first two didge purchases were crafted by a local. I lived in Australia for five years about 20 years ago. Back then, didges did not interest me. Three and a half years ago when I moved to southern California, suddenly didges made sense. The didge in my hand was clearly western. Maybe I would learn more in an hour or two. I found my night tables and other items, set them aside with the didge, and told the guy behind the counter I would be back. Time to see a friend for lunch. When I returned, I was told the owner didn’t know anything about the didge, either. Then I was presented with an offer I couldn’t refuse: The didge was mine for $100. I got it into the car, along with my night tables and other purchases. I had business elsewhere in town later in the day. Time to play with my new toy. I found a nearby city park, headed to a secluded corner overlooking a valley, positioned myself beneath a tree, and started familiarizing myself with the instrument. All things originate from vibration. I looked up. A man I hadn’t seen before was approaching. Oops! I was obviously disturbing him. Time to apologize and find another spot. This is his mother’s memorial, he told me. Oh, crap. Now I better run. His words gushed out: His mother had died two months earlier. She loved the view from this section of the park. Some of her ashes were scattered here. What do you call that instrument? he asked, his voice choking. Could I keep playing? Thank you, he sobbed a minute later. Thank you. Over the next 30 minutes, he walked this way, then that way, positioning himself at various outlooks, staring out into the valley, then returning to my spot, holding his phone near the bell of the instrument, talking to his friends, leaving messages to his friends, leaving messages to himself. It was time to go, back to that other world, the real world, not real, yet real. I cradled my new didge, not just a didge, just a didge. Carefully, I placed it in the back floor of my car, in a gap beneath the night tables. I got behind the wheel, found my street - and turned the wrong way.